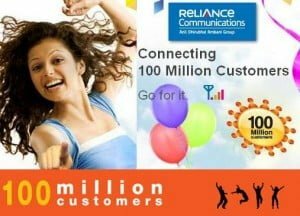 Reliance Communications, India’s largest and only nationwide operator offering both GSM and CDMA mobile services, today announced Unlimited Free Callings (Local and STD) for its Postpaid and Prepaid subscribers (GSM and CDMA) with in Own Network on the occasion of achievements a landmark of 100 Million Customer in India. To celebrate the 100 Million Customers base the operator introduces Free Reliance to Reliance Local and STD calls offer starts from the midnight of 28th March 2010. With the Free Calling offer Reliance Mobile subscribers can make free Reliance to Reliance calls all over India without subscribing any pack for a full day (24 Hours).To avail the 100 Million Free Calling offer for one Day Reliance Mobile CDMA and GSM prepaid subscriber should have minimum Rs.10 in their main account. Reliance Communications has also announced plans of launching a slew of initiatives over the next 100 days. A customized “100 Million Caller Tune” will also be launched as part of the 100 Million announcement. The company’s 100 Day Celebrations will run in 24,000 towns and 6 lakh villages across the country. But…what is the gift that was promised and who got it by giving sweetest,oily.greasy comments?????????????????? ?